Due to my product management role within the SAP Connected Health organization, I want to eat our own dog food / drink our own champagne, so that I have hands-on experience and really can put myself into the shoes of our customers. Therefore, I decided to give our cloud-based trial version of the SAP Connected Health platform and SAP Medical Research Insights a try on Amazon AWS by using the SAP Cloud Appliance Library (CAL). My colleague Enakshi Singh recently announced this in a blog entry. 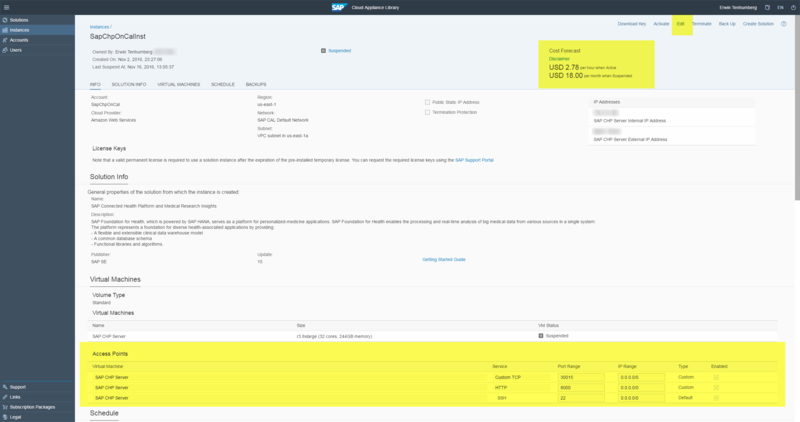 A first starting point is definitely the document “Getting Started Guide for SAP Connected Health Platform and SAP Medical Research Insights, Cloud Appliance Library – Trial Version”. However, as I didn’t have any hands-on experience with both Amazon AWS and the SAP Cloud Appliance Library yet, I needed a little bit of additional help, which I would like to share here. The pre-configured users including their passwords are listed in the Getting Started Guide mentioned above. If you cannot access the system, you might want to restart the instance after you have configured the “Access Points”, i.e. doing a “Suspend” followed by an “Activate”. For cost control reasons, you also might want to define a schedule for activating and suspending the instance or a budget within the Amazon AWS management console.